These are the instructions to use Qualcomm Fastboot Upgrade C Tool to Flash Stock Firmware on Qualcomm Smartphone and Tablets. Requirements: You need to have a Physical Qualcomm Smartphone or Tablet to follow the following Guidelines. If in case your device isn’t powered by Qualcomm chipset then the guidelines will not work for you. Step 1: Download and install Qualcomm Drivers on your Windows Computer. If in case you have already installed the drivers, then SKIP this step. Step 3: Now, Copy the Contents of ADB Environment Folder to C:\Windows\System32 Folder. Once you have successfully copied the contents to the System32 folder, follow the next step. 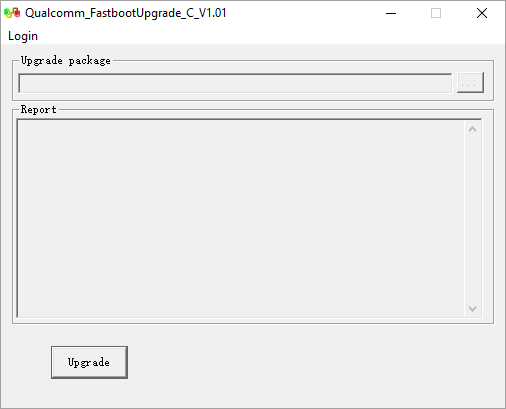 Step 4: Now, Open Qualcomm_FastbootUpgrade_C_V1.01.exe to Launch it. Step 6: Now, Click on the Login Button and enter admin as password and click on OK button. Step 7: Now, Click on the Browse Button and Locate the Stock Firmware on the Computer (assuming you have already downloaded the firmware). Step 8: After Adding the Firmware into the Tool, Click on the Upgrade Button to begin the Flashing process. Step 9: Now, Boot your Device into the Download Mode by Pressing Power + Volume Down Button. Once your device is booted into the download mode Connect your Device to the Computer using the USB Cable. Once your device is connected successfully, Flashing process will Start Automatically. Step 10: Flashing process may takes upto 5-10 minutes to complete (depends on the size of the firmware). Step 11: Once Flashing process is completed, you will be able to see Green Pass Message in the Tool. [*] Caution: We recommend you to take a backup of your personal data before flashing the stock firmware using the Qualcomm Fastboot Upgrade Tool. As your personal data will be deleted permanently after flashing the stock firmware. [*] Alternative Flash Tool: We have shared bunch of tools, which also allows you to flash stock firmware on Qualcomm Devices including QFIL Flash Tool, QcomDloader Tool, GNQC Download Tool, Qcom Phone Download Tool, Smart Phone Upgrade Tool, eMMC DL Tool, Qualfast Tool, Mi Flash Tool, QPST Tool. [*] Credits: Qualcomm Fastboot Upgrade Tool is created and distributed by Qualcomm Inc. So, full credits goes to them for sharing the tool for free.